This week’s up & coming rider is Alexandra Maracic! 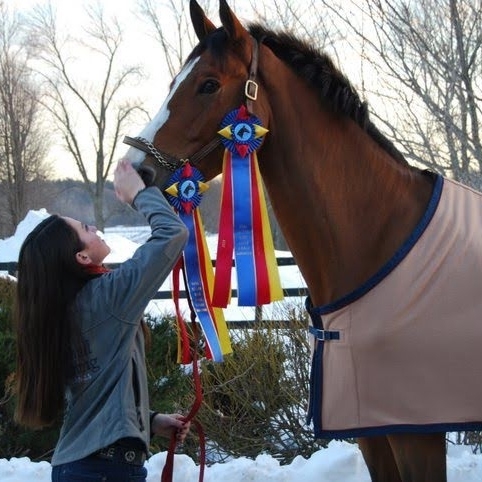 This past year, Alexandra and her former equitation horse Po placed fourth in the Pessoa/ US Hunter Seat Equitation Medal Finals at the Pennsylvania National Horse Show. Po also won Best Equitation Horse. The past year has been peppered with amazing accomplishments and devastating heartbreaks, but Alex has taken it all in stride and remained positive, focused, and ambitious. Alex is 17 years old and comes from New York. She describes her life as “family, school, and horses.” She has hopes of becoming a top competitor in this sport, much like all of us. When Alexa was two years old, she sat on her first horse and “fell in love.” Horseback riding is somewhat of a family pastime, as her mother had backyard horses when she was younger. While Alex’s mom was into pleasure and western riding, Alex found her way into English riding with her first pony at 8 years old. Alex & Po. Photo Courtesy of Google+. Alex’s biggest accomplishment thus far and her biggest challenge came not too removed from each other. Shortly before the Pennsylvania National Horse Show, her trainer and mentor, Ross Reisner, was brutally murdered in his home on Long Island. Alex has recently decided to get into the jumpers after competing in the equitation classes for the past 3 years. Because she can only keep one horse at a time, Alex made the tough decision to sell Po and acquire a junior jumper named Coridon Z.
Alex purchased Coridon Z, ‘Don,’ at the end of August. He was imported from Europe about a month before Alex bought him. “My favorite thing about Don is that he is so gentle cuddly. He allows my 10 year old sister to walk him around an open field like he’s a puppy dog. He is so forgiving and he is just so much fun to ride. I don’t really have a challenge with him yet because he is so new to my family and I’ve only showed him once so far,” Alex said. Unfortunately, Don had to put to sleep in early March because of cancer in his spleen. While Alex was heartbroken over the loss of Don, she has stayed firm in her riding goals. She has started riding at Heritage Farm with Andre Dignelli, the well-known trainer of some other big name riders like Lillie Keenan. Alex plans on continuing to ride once she ages out of the juniors. She will be attending college and riding on a collegiate equestrian team. She plans to open her own business, be successful, and take her riding to the professional level. This past winter, Alex got to live the equestrian dream of being at WEF. However, it wasn’t all fun and games. “Balancing school and being at WEF is a bit hard because I have really long days of work. I make sure I get all of my work done at the time I’m at the tutoring place so I don’t have much to do when I get home,” Alex said. A typical WEF day for Alex consisted of going to school, riding, and doing school work. She attended school from 7 am to 12 pm Monday through Wednesday and promptly went to work at her farm. From Thursday to Sunday, Alex would work from 7 am or earlier depending on horse show time until whatever time everything finished. Alex currently works for Michael Zukerman, a trainer that she has known for a while since he trains at her farm on Long Island. During her time working for Michael, Alex said she has learned so much and that she highly recommends becoming a working student though it can be challenging at times. While at WEF, Alex got to take a lesson with the famous George Morris. She uploaded a video of her lesson to her YouTube account. Alex has certainly seen a lot of success in her riding career, but she gets nervous like anyone else. Alex tries to ride about 6 days a week, when possible. However, she said she never rides less than 4 days a week. When she isn’t riding, she is reading or going for runs. When she is riding, Alex said that she doesn’t have a favorite exercise that she does with the horses, but if she had to choose, it would be shoulder-in. She also loves water jumps. Alex said her biggest riding weakness is getting frustrated with herself. (Editor’s Note: Mine too!) Her strength when riding is jumping. When it comes to must-have equestrian items, Alex said that while it’s hard to choose, she has to pick her Ogilvy pad. She also loves her charcoal Tailored Sportsman breeches, her orange H belt, and her La Mundial boots. When it comes to other young riders, Alex expressed concern for other riders’ attitudes toward their partners. Alex has certainly made great strides in her riding career, and it seems as if she has great things ahead of her despite the setbacks. She has remained positive and determined to achieve her goals. Want to keep up with Alex and her progress this year? You can find her on Twitter and Instagram!